Someday Richard Madden may find a role that will let him use a cell phone or a toothbrush, but that day isn’t today. 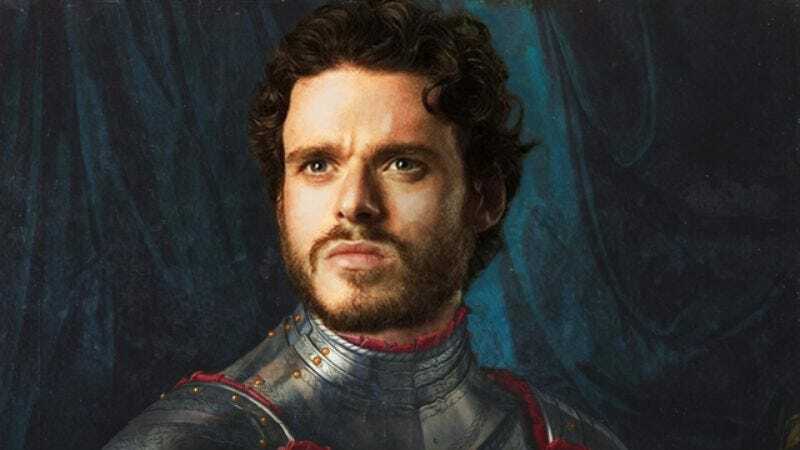 The Wrap reports Madden, best known for playing Robb Stark in Game of Thrones and Prince Doesn’t-Have-A-Name in Cinderella, will return to a world of questionable hygiene in an eight-part miniseries, Medici: Masters of Florence, dramatizing the rise of Italy’s famous historical family. Madden will play Cosimo de’ Medici, with Dustin Hoffman attached to play Giovanni, Cosimo’s father. Giovanni was responsible for founding the Medici Bank, which set the path for the family’s rise to power. The Medicis certainly have all the necessary qualities for a compelling story. At its height, the Medici bank was Europe’s largest financial institution. The family was absurdly wealthy and Cosimo became the unspoken ruler of Florence. But just as interesting as all the subterfuge, power-broking, and figurative (and literal) backstabbing germane to historical dramas such as this is a legitimately amazing fact: The Medicis are known for leveraging their vast wealth to almost single-handedly usher in the Italian Renaissance. The family funded the creation of libraries, churches and universities. Cosimo’s grandson Lorenzo was a famous patron of the arts, commissioning some of history’s best known works and supporting the careers of two of the four Ninja Turtles. The series is currently only slated to play in Italy, with international distribution still pending.